Renowned business and community leader will receive honorary degree, speak at graduation ceremony - Dec. 12. Jim Boscov, vice chairman and CEO of Boscov’s Department Store, LLC, will receive an honorary Doctor of Humane Letters degree from Alvernia University in Reading, Pa., before offering remarks to the winter Class of 2015 on Dec. 12, 1 p.m., in the Physical Education Center, main campus. 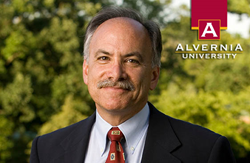 Recognized as a Trustee Emeritus, Jim Boscov has a long history with the Alvernia University, where he served as a trustee for more than a decade and was Chair of the Board during the institution’s transition from college to university status (2006-2008). The Boscov name has become synonymous with the Shirley and Joseph Boscov Scholars program at the university — made possible by generous support from Jim, his wife Cindy (a current university board member) and Jim’s mother, Shirley. It is the premier award for outstanding Berks County high school graduates attending Alvernia. The Boscov family’s generosity is well known in the community as well. “The Boscov name, especially here in Berks County, is synonymous with leadership, character, generosity and community spirit,” said President Flynn. Originating more than 100 years ago in the city of Reading, Pa., Boscov’s has grown to become one of the nation’s largest family owned and operated department stores with more than 40 retail locations in seven different states. Jim Boscov began his career as an assistant store manager in the family business, in 1975. He has served in a variety of positions in store management, store planning, advertising, and as a buyer and merchandise manager in a number of retail divisions within the company. He gained outside experience as vice president of retail for the Boston-based women's sportswear company, Cambridge Dry Goods, before starting his own venture called Buyers' Edge. In 2008, Boscov returned to strengthen and expand his family’s business. He was named vice chairman in 2011 and CEO in 2015, becoming the third generation of the family to lead the company. ALVERNIA is a thriving university that empowers students through real-world learning to discover their passion for life, while providing the education to turn what they love into lifetimes of career success and personal fulfillment, helping them make the world a better place. Situated on a scenic 121-acre suburban campus in historic Berks County, Pa., the university of more than 3,000 students is conveniently located near Philadelphia (60 miles) and within an easy drive of New York, Baltimore and Washington, D.C. With a College of Arts and Sciences and College of Professional Studies, Alvernia today offers more than 50 undergraduate majors and minors and a range of graduate programs at the master’s and doctoral levels through its School of Graduate and Adult Education. Satellite sites are located in Philadelphia and Schuylkill County. As one of only 22 Franciscan institutions in the country, Alvernia’s focus on caring for each other, the environment and the community are joined with a challenging educational experience to provide an unparalleled environment to grow, develop and mature as a person and professional.